Cast vehicle end. Includes windscreen wipers, corridor connections, buffers, dummy buckeye couplings, roof horns and jumper cables. 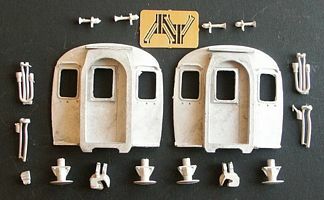 Suitable for use with etched coach sides from the MJT range MJT 1010 4CEP. 2 complete ends per pack.